The 25 litre Safari Tank for Husqvarna’s 610 range now allows riders to unleash the adventure potential of their bike. Like all Safari Tanks products, the tank has been designed to keep the weight as low as possible, while at the same time retaining the original ergonomics of the bike. The result is a tank that gives the rider a great feel on the bike, while opening up the potential of their steed for longer rides, without the worry of refuelling at regular intervals. The tank fits the FUEL INJECTED 610 model. 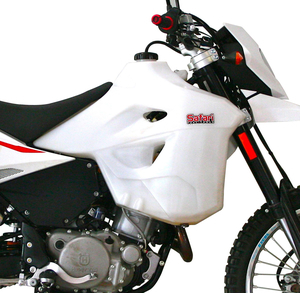 Includes: fuel cap, breather hose, 2 taps, cross over tube and Husqvarna fuel line.